an instant gratification garment .... check out New Look 6915. This top is easy and can be done in an evening... seriously. Twice in one week I found myself browsing the racks at The Loft with a 25% coupon burning a hole in my pocketbook and on top of that they were offering 40% off reduced items. However I was determined to keep in tune with not buying rtw, but longing for a garment other than what is in my closet and left the store. Arrived home still hungry for something new to wear to the office. I looked at the patterns that were already cut, but not satisifed, looked at the time and realized that whatever I was going to sew needed to be a quicky and my eyes settled upon NL6915. 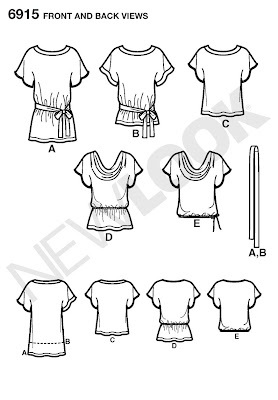 I'd already made this top and this top with Version D of this pattern and was not in the mood for cutting bias strips for the neckline and took a closer look at Version C.
Version C is a boat neck blouse with dolman sleeves that can be accessoried with a belt and perfect with jeans, slacks or a skirt. Earlier this week this blouse was worked up using a black/white abstract sheer polyester that I'd purchased from Fulton Fabrics $3.00/yd. I serged and straight stitched all the seams and for the neckline instead of using the fashion fabric for the neck band I used black china silk. Using the fashion fabric for the neckline would've been too visible on the underside. To ensure that the neck band would not flip to the right side I edge stitched and did another row of stitching about 5/8 from the edge stitching, which worked perfectly. I wore this blouse under a suit taking into consideration the super sheer factor. Enjoying how quickly the blouse worked up I decided to do another Version C for Casual Friday using a crosswise stretch knit. To avoid the blouse being too big width wise I cut the blouse with the stretch going length wise. This fabric was purchased from Walmart @ $2.00/yd and like the print which gives the look of being hand-painted. I did not bother with the neck band and instead just serged the neckline and folded to the inside finishing off with a row of stitching along the neckline. Well its way past my bedtime, but happy that my blouse has been hand washed and laid flat to dry and ready for wearing tomorrow. Great new tops, they look fantastic. Love both your of your tops! The friday one is nice but I really like the black 'n white one! That must have looked awesome with a suit! The blue/green one for Friday is fierce. Looks great on you. So cute, I love both of them you are a genius when it comes to fabric choices. I love the Casual Friday top. That fabric is beautiful. I love blues and greens. The black one is slammin' too. Very nice ! I have joined your band wagon with this pattern.. I made one this week and will be posting it soon.. I love both your tops... The black and white is my favorite. Both tops look great and they're great wardrobe builder pieces. NICE!!!!! Your tops are stunning, especially the black and white one. I love you have placed the print, it's so effective. You sure have a knack for getting your money's worth out of patterns yet making distinctively beautiful pieces. Great job on both new tops. Love instant gratification! So many times I check out your blog and find myself writing down another pattern # on my 'to buy' list! I love both tops... everyone needs a fast fix pattern sometimes. I love having patterns like that on hand and ready to sew. Both tops are adorable. Great job cute. Both tops are really great. It's hard to believe those are instant gratification projects. Thank you Ladies and hoping everyone is having an Awesome Friday... TGIF!!! @ Carolyn, yes the black/white blouse popped under the black suit... I love abstract prints. @ Opal, glad to hear you purchased it... its a great garment and works well with different garments. @ Sue, there was a grading of color along the bottom of the fabric, but couldn't figure out how to incorporate it. @ Angelia, glad I was able to inspire you... you will definitely get your money worth. 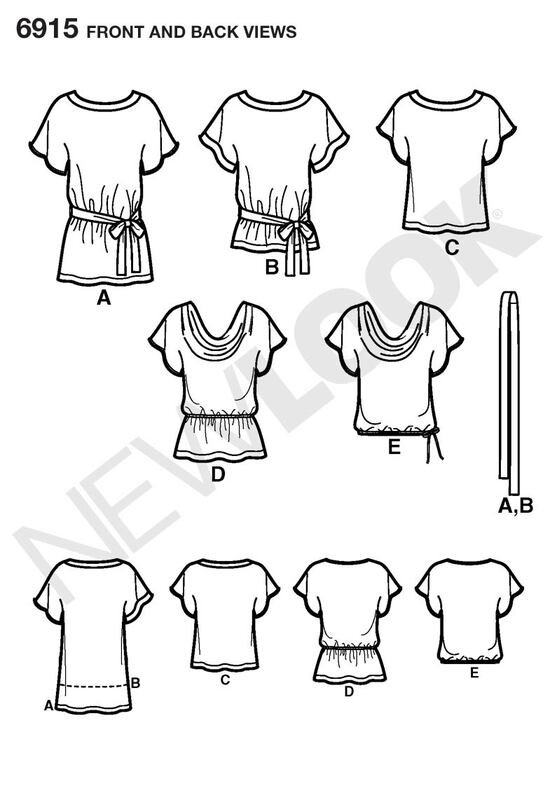 Fantastic blouses - how great to be able to sew one up that fast! Do you have any more closet space in your house?? I love the blouses -- sheer is "in" this season so the first top fits right in. I can't believe how much you crank out and it's all quality too. You are prolific! Love these tops. Thanks again for the lovely compliments. @ eword: I've taken to managing my sewing time better and also incorporating easy projects allows me to crank out a garment per week. Wow! I just found your blog, and it's awesome. You are fantastically skilled. Major inspiration. The top looks better on you than on the pattern envelope. Seriously. And I love that blue/green fabric. Thanks for that tip about which way to cut the knit - that may be why it looks so much better "live". I may have to get this pattern now. Great tops, I will definitely have to pick this pattern up. I love a quick project! Oh.., beautiful. Love both of them. That green fabric is rich.